Fittingly, while we were in Iceland in April 2015, a landmark study about the benefits of sauna was published in the Journal of the American Medical Association (JAMA). The investigators prospectively followed 2,315 middle-aged Finnish men for 21 years. 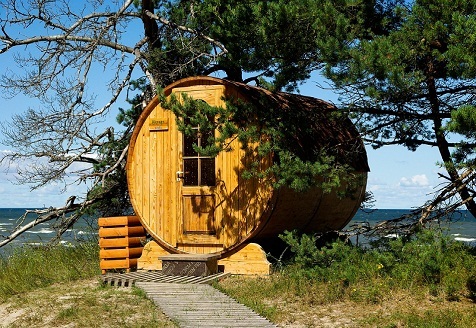 Sauna use reduced risks of sudden cardiovascular death, almost by half. Death from any cause during the study was about 40 percent lower in the men who took a sauna four or more times per week. Sounds too good to be true - getting the cardiovascular benefits of exercise while lounging in a hot tub!? Heat therapies including sauna, steam baths and hot tubs cause dilation of your blood vessels and increase the heart rate. The amount of blood pumped per minute through the cardiovascular system more than doubles during a typical sauna. This dramatic increase in blood flow stimulates the vessels to produce more nitric oxide - a critically important compound that dilates arteries and veins and keeps them soft and supple with a Teflon-like coating that prevents dangerous blood clots. In essence, making a habit of sauna, steam or hot tub therapy, like an exercise routine, tends to make blood vessels healthy and happy, which is good for your whole body, especially the brain, skin and heart.